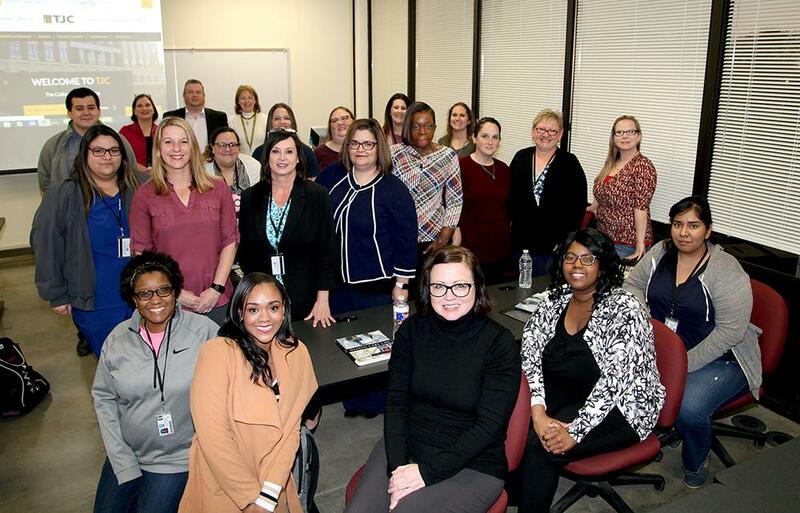 The inaugural class of TJC’s newest baccalaureate program, the Bachelor of Applied Technology (BAT) in Healthcare Technology and Medical Systems (HTMS), poses for a first-day photo on Thursday, Jan. 17, 2019. On Thursday evening, the inaugural class of 20 students took their seats and their first steps toward earning a Bachelor of Applied Technology (BAT) in healthcare technology and medical systems (HTMS). The program is designed for working professionals who wish to advance into a higher level of management in the healthcare industry. During Thursday’s first session, HTMS Department Chair and Professor Dr. Tammy Burnette introduced Dr. Bryan Renfro, TJC associate vice provost for academic and workforce affairs who is also the acting dean of the TJC School of Professional & Technical Programs, and Loretta Swan, department chair and professor of health administrative services. Designed for students who juggle work and family, the program offers classes in flexible but intensive five-week sessions. This allows students to complete their upper-division courses in five semesters while only attending one night per week. Swan encouraged class members to manage their schedules carefully. Burnette said all of the students in the HTMS cohort hold associate degrees. About half are recent graduates of TJC’s two-year, medical office management or healthcare administration programs. The other half of the cohort currently holds leadership -- manager or director -- positions in these organizations. Most are mid-level managers who could be in charge of areas such as revenue cycle, coding and emergency room management. Shelly Maxfield falls into the “longtime professionals” category. She’s been employed at Texas Oncology-Tyler for 15 years, working in its clinical research department. When she started taking classes at TJC in 2011, she was a clinical research project coordinator at Texas Oncology. She earned an Associate of Arts in general studies in May 2016, but the degree was not specific to her career. In May 2017, Maxfield became the program’s first graduate, earning an Associate of Applied Science in healthcare administration. The new baccalaureate program is Maxfield’s next logical step. For more information, go to www.tjc.edu/HTMS.